The Color Throwdown challenge for the week is here and that always makes for a great Wednesday! Once I saw this week's colors, I knew right away which paper pad to choose. All of the papers I used are from Lawn Fawn. They are terrific in their color coordination. The little stamped and embossed mittens in the shaker are from MFT Stamps. The sequins are from Pretty Pink Posh. Here is a look at this week's colors. I just love the vintage palette. I hope you will play along with this week's challenge. This is the very first day of the challenge, so you have plenty of time to make something fun. And remember, you don't have to have the exact colors. They always tell us to just use the closest match you have. So have fun and get to creating! oh my gosh, this is so pretty and festive! I adore it! Perfect for the challenge! I just LOVE this Susie!!! A perfect shaker card!! Thanks for playing along with us at The Color Throwdown! I saw your card at Color throw down...I love this paper! Cute shaker! I just love your shaker card, Susie...how cute!!!!! Thanks for joining us at the Color Throwdown Challenge!!!! 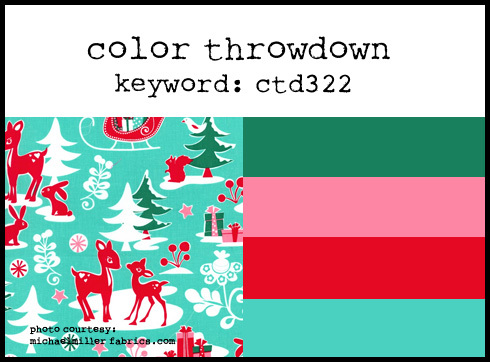 Cute shaker card, Susie... great use of the Throwdown colors! Thanks for joining us this week.